Please Take Note: This is a review of the game’s final prototype. The art, game bits, and the rules discussed are all subject to change. The game is being reviewed on the components and the rules provided with the understanding that “what you see is not what you might get” when the game is published. If you like what you read and want to learn more, we encourage you to visit the game’s official web site and the game’s Kickstarter campaign. Now that we have all that disclaimer junk out of the way, on with the review! From the ashes of war arose a new order determined not to repeat the past. The center of power dwells in the walled city of Euphoria that you call home. Peace and prosperity is abundant, but all is not well. The new world order of Euphoria’s elite keeps tight control of the masses through subtle influence. You have been quietly watching, waiting, and learning the game so you, too, might play it. 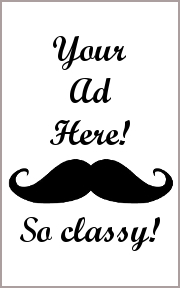 You are a danger – a threat – because you have ideas of your own. 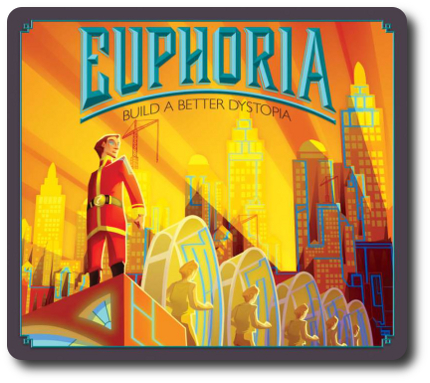 Euphoria: Build a Better Dystopia, designed by Jamey Stegmaier and Alan Stone and to be published by Stonemaier Games, will reportedly be comprised of 1 game board, 48 Recruit cards, 36 Artifact cards, 6 Secret Agenda cards, 24 Workers (standard six-sided dice in the colors green, blue, red, white, black and purple; 4 in each color), 12 wooden Player tokens (in the colors green, blue, red, white, black, and purple, 2 in each color), 27 Resource tokens (representing gold, clay, and stone; 9 of each), 48 Commodity tokens (representing energy, water, food, and bliss; 12 of each), 7 Progress tokens, 60 star-shaped Ownership tokens (in the colors green, blue, red, white, black, and purple; 10 in each color), 12 Market tiles, 6 Multiplier markers, and 8 Allegiance bonus markers. As this is a review of a prepublished game, we will not comment on the game component quality. I will state, however, that the art by Jacqui Davis is simply outstanding and never ceases to impress me. To set up the game, first place the game board in the middle of the playing area. Second, shuffle the Market tiles and randomly draw 6, placing them face-down on the various construction sites found on the game board in any order. Note that a few locations on the game board have preset markets. Any unused Market tiles are discarded for the duration of the game. Third, place the Progress tokens on each of the 4 circular symbols on the far left of the Allegiance track, 1 each on the starting positions of the Tunnels. All 7 Progress tokens should now be on the game board. Fourth, place one Player token for each player on the “Start” spaces on the Morale and Knowledge tracks. Any unused Player tokens are removed for the duration of the game. Fifth, place the Commodity and Resource tokens on their designated location on the game board. 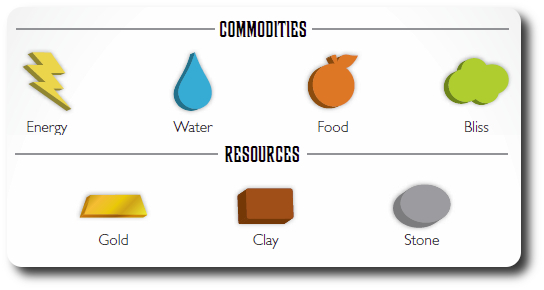 Note that the game bits that represent the Commodities and Resources are small in number, but there is no limit to them in the game. Players use the Multiplier markers to help represent sums of commodities and resources that cannot be represented by physical tokens. Sixth, shuffle the Secret Agenda cards and deal 1 to each player. Players should look at this card but keep it hidden from their opponents at all times. The Secret Agenda card is placed face-down in front of their owning player. Seventh, shuffle the Recruit cards and deal 4 to each player. Each player now reviews their 4 Recruit cards and chooses to keep 2, discarding the other 2. A player then chooses which of the 2 cards they want to keep face-up and which to place face-down. The face-up Recruit card represents a “known” follower who will do your bidding. The face-down Recruit card presents a follower that none of the other players know about…yet. Any unused Recruit cards are gathered and placed face-down next to the game board. This is referred to as the “Recruit deck”. Eighth, shuffle the Artifact cards and place it face-down next to the game board to create the “Artifact deck”. Ninth, hand to each player a Multiplier marker and 2 Worker dice that matches the color of their Player token. All the remaining dice are grouped together to the side of the game board to form a pool of recruits the players can dip into later in the game. Tenth, each player now takes their two dice and rolls them. The player with the highest total value will be the first player (with turn order going counter-clockwise). The dice values are left as they landed. These numbers represent the starting knowledge of their workers. That’s it for game set up! Let’s build a slightly less horrible futuristic tomorrow! Note: While I don’t personally consider Euphoria to be an overly complicated game, the rule book will go into much more detail than what is considered “sane” for a game review. Please refer to the rule book available on the Kickstarter campaign page for additional details on game play. The game is played in turns with no set number of rounds. On a player’s turn, they will be able to take 1 (and only 1) of 3 possible actions. These actions are summarized here. If a player has an available Worker, they can place 1 (and only 1) on the game board. The only exception to this rule is if the player has a number of Workers with the same rolled value showing in pairs, three of a kind, or four of a kind at the beginning of the their turn. If this is found to be the case, the player can place all the Workers who share in the pair, three of a kind, or four of a kind in a single turn. Any Worker rolled mid-turn (from recruitment, being moved, or simply being put to work) cannot be used again in the same turn. There are many different locations to place a Worker on the game board and each is identified with a cube-shaped icon that shows where a Worker can be placed. Each location represents an action of which there are three specific types. Temporary Use: These locations allow a player to gain allegiance, resources, commodities, and even control the hearts and minds of the workers. Note that some Temporary Use locations require the player to “pay” for their use using various resources. Temporary Use Worker locations can only contain 1 Worker at a time. When placing a Worker on a Temporary Use location that currently has another Worker on it, the previously placed Worker is “bumped” (removed) and given to their owning player (much in the way Option 2 is completed). Bumped Workers are re-rolled and then added back to their owning player’s Worker pool of dice. One-Time Use: These locations demand payment upfront to activate them. Unlike the Temporary Use locations, Workers cannot be bumped from these locations once placed. Multi-Use: These locations are open to everyone and can contain any number of Worker dice. No one can be bumped from these locations. While a player’s first option was focused on using Workers and placing them on the game board, this option is focused on calling them back. A player can use their turn to take back 1 or more of their Workers, but at a cost. When pulling back Workers, the player is given a choice. They can pay 1 Food or 1 Bliss to retrieve all their works on their turn and gain 2 Morale in the process, or they can choose to pay nothing and their Worker’s Morale is reduced by -1. Each player is dealt a secret agenda that they alone are attempting to accomplish during the game. 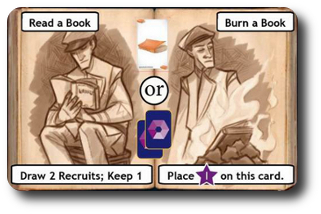 Each Secret Agenda card lists artifacts and resources that must be spent to complete the agenda (player’s choice regarding what they want to spend). They are then given a choice. Do they fight the power or aid it? Fighting against the system will draw the attention of other freedom fighters who will flock to the player. The player draws 2 Recruit cards from the Recruit deck and keeps 1, placing it face-down in font of them. If the player has achieved a certain level of allegiance, they can select and place the new Recruit card face-up right away. 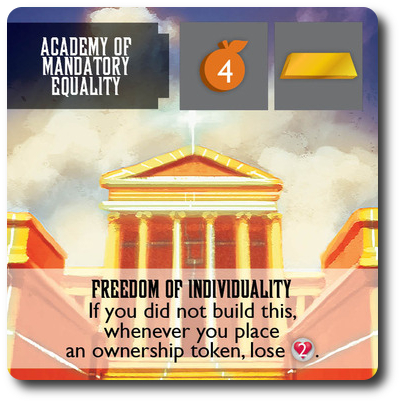 If the player chooses to strengthen the very system that is oppressing everyone, they place 1 Ownership token on the card. Now that you know “what” you can do on your turn, let’s learn “why”. All these Workers being placed are a means to an end. Each player is attempting to manipulate their Workers to obtain their own selfish goals which might or might not be in the best interest of the Workers. You see, Euphoria is not necessarily about making a “better tomorrow” for everyone. Each player is attempting to work their way through the totalitarian system to rise above the rest. If a player can keep the morale of their Workers high, they have more room to make choices. Thematically speaking, a “happy worker” is an easy to control worker. The Moral track notes the hand size limit the player must adhere to. If the Moral track value drops to a number that is lower than the number of cards the player has in their hand, they will be forced to discard down. The maximum hand size to be achieved is 6 cards. In order to subtly change the system, the player must keep their Workers in the dark regarding their true motives. This is a lot harder than it seems. 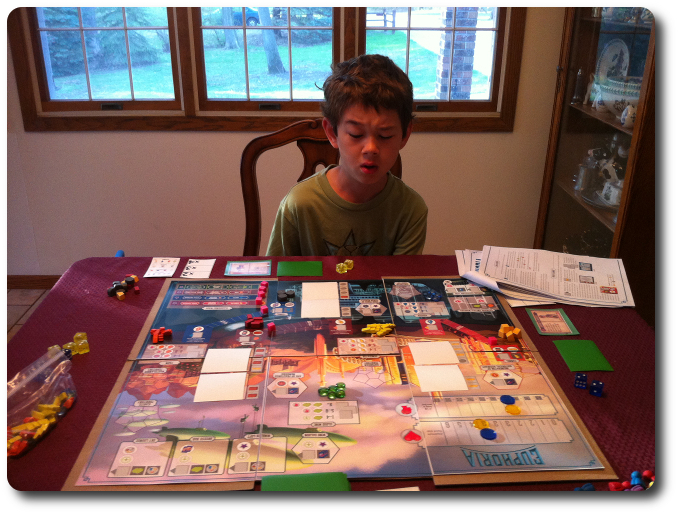 As the game progresses and the player collects more Workers, they draw more attention to themselves. People become curious and curious people ask questions. Eventually, a Worker will know too much and realize that the player is not to be trusted. When a player retrieves a worker (be it from a turn option or if the Worker is bumped), the Worker is immediately re-rolled. The player now adds all the number values of their Workers (both on the game board and in front of them) and adds their current Knowledge track level to it. If this total value is ever 18 or more, the player immediately looses an available Worker with the highest rolled value, returning it to the Worker pool at the side of the game board. Thematically speaking, what just happened is that the Worker knows what the player is up to, doesn’t like it, and runs away. The Allegiance track keeps a record of the different factions the players are currently collectively winning over. Winning a faction is done by Worker placement, but the players must be working with at least 1 visible Recruit that belongs to the faction in order to collect that allegiance point. As the players gains more clout with a faction, their overall level of allegiance will jump to different tiers. Each tier (of which there are 4 in total) provides a specific bonus that is unique to each faction. For example, the first tier for the Wastelanders provides 1 Food when placing workers on a farm and the first tier for the Euphorians provides an additional energy when the player places a Worker on the generator. The final goal (or 4th tier) of the Allegiance track is total obedience from the factions. It if helps, think of the Allegiance track as a clear indicator that suggests how well the players are duping the people of the world. 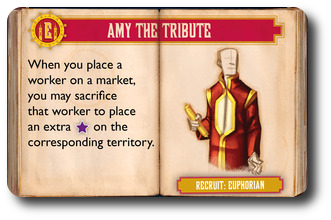 A player’s followers, in the form of Recruit cards, will stick with them to the bitter end (the same cannot be said for Workers). They are “movers and shakers” in their own right, but lack the vision and moxie to do much more than play a minor role in the larger game of intrigue and control. They are exceedingly easy for the players to manipulate and are powerful means to an end. Each Recruit will provide a special ability that can sometimes be triggered at the player’s discretion or is triggered by default. Most of the time, these abilities are based on actions the player takes. For example, placing a worker on a specific location. To use the Recruit, the player must have it facing up and visible to all the players. The face-up Recruits are the “true believers , while the face-down Recruits are still deciding if they want to trust the player or not. The game board represents the four different areas controlled by the different factions. 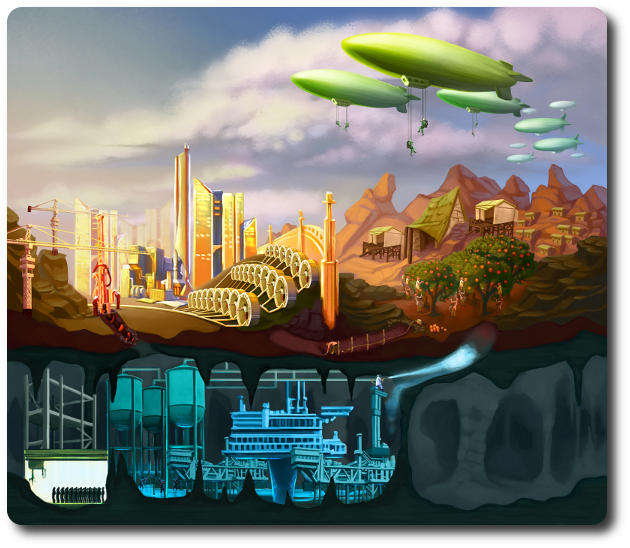 The player will be placing their Workers in these different locations to utilize each location’s specific benefits. Some locations provide commodities that can later be used as payment. Some locations allow the player to acquire additional Workers. Most locations take a little to give a little, and the more times the player uses the Workers, the overall moral, knowledge, and allegiance will slip and slide. For the most part, the factions have lived their lives with little to no knowledge of each other, each contributing a small part to the Euphorian elite society that the players are a part of. All of that is about to change. Tunnels and pathways are being built to connect factions together. To a “true believer”, this would appear to be a move on the player’s part to bring groups together to be joined and strengthened. This is not the case. Digging tunnels provides resources and rare artifacts, as well as providing a “backdoor” to a faction’s commodities. Such work does not go unnoticed when the tunnels are being dug, and a player’s hidden Recruit might be revealed as a result, even if the player is not actively digging themselves. In this way, a player could let an opponent do all the work and gain all the benefits without lifting a finger. One of the truly remarkable (and highly illegal) markets to visit is the artifact market. Here the rarest of the rare can be found for sale. Strange and miraculous things called “books” and “toys” that have been dug up and presented for the most wealthy of Euphorian society to look over and secretly covet are on display. These are dangerous artifacts to be sure because they could lead an individual to question the world around them. Of course, there are those who will pay great sums of resources, commodities, and favors for a chance to secretly own such items of rarity. Artifacts can be found while digging tunnels, and if the player is lucky enough to find 2 or more of the same artifact, the amount of wealth and power that can be asked for as payment is staggering. Finally, the player can contribute to the world by building market places and other locations. When the game starts, the Market tiles are face-down and unknown. A player can send their Workers to help build whatever the Market tile might be (player’s don’t know what it is until it is revealed). For those who assist in the building, there are beneficial perks to be obtained. For those who choose not to, the consequences could be harmful. When a player helps build a location, they obtain certain personal freedoms. These freedoms are removed from the players who didn’t “chip in” when the location was under construction. While the player will be sending their Workers out into the world to do their bidding to collect commodities, resources, and artifacts to be used as payment and bribes, the overall goal is to claim power through ownership. As the game progresses, the players will be placing Ownership tokens in the Euphorian, the Subterran, the Wastelander, and the Icarite territories. A player can own several portions of the same territory, but the total number of portions available to own is based on the number of players. Through Workers and Recruits, the players will be able to obtain enough power and control to start claiming pieces of the world. This is the main goal of the game. The game ends as soon as any player places their 10th Ownership token. This player is declared the winner and the future might or might not be brighter for it. 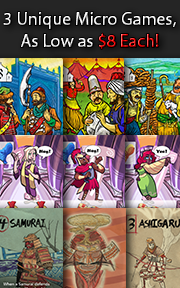 To add more complexity and strategy to the game, the following game variants are provided right out of the box. Recruit Drafting: instead of each player being given 4 Recruit cards at the beginning to choose from, each player selects 1 of their 4 Recruit cards and passes the rest to the player to their left. The players then select a Recruit card from the cards they were just given. This repeats until all the players have 4 Recruit cards. From these 4, the player selects 2 to play with. Limited Resources: to simulate a truly corrupt and crumbling dystopian society, the resources and commodities are reduced based on the number of players. 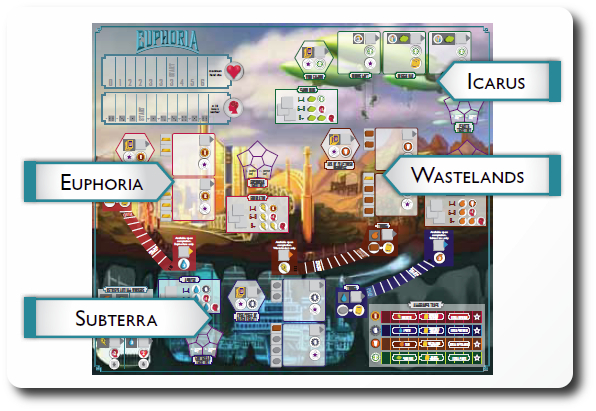 To learn more about Euphoria: build a Better Dystopia and read the full rules, visit the game’s official web site and the game’s Kickstarter campaign. 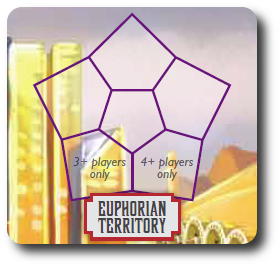 Essentially, Euphoria is an area control, dice rolling worker placement game with resource and hand management stirred in with variable player powers. Individually, these game mechanisms are very easy to manage. Put them all together and you have a complicated game on your hands. But is Euphoria really a complicated game? I don’t think so, but then again, I’ve been playing games a long, long time. What strikes me as the obvious prediction is that players who have had past experience with heavy Euro-style games will take one look at Euphoria and its really big board and say, “Yep, got it!’ Everyone else is going to look upon the vast landscape of possibilities and be left feeling bewildered. For the Child Geeks, I doubt Euphoria will get much traction. While I don’t think the game rules are difficult, the many choices available to them is going to be overwhelming. Not at first, mind you, as there isn’t much a player can do in the beginning of the game other than send their Workers out into the world to start gathering commodities. Once the player has enough commodities, they can start work on gathering resources, and then artifacts, and then allegiances, and then more workers, and AAAAAAaaaaaaaaahhhhhh! I think the game is going to quickly snowball on them with its heavy weight of multiple choices. For the Parent Geeks and the Gamer Geeks who are familiar with Euro-style games where collecting resources and managing workers is common place, I think Euphoria will be a hit. The game play time looks to be fairly quick and the actions (not the choices) are small in number allowing for quick game play. For the Parent Geeks who are looking for a casual game, Euphoria looks to be just a bit more involved than what they might like. Additionally, if the Parent Geek is a non-gamer or just doesn’t care for games like Euphoria, they aren’t going to be happy players. Teaching Euphoria is a bit tricky. The only way to do it right is to go through each of the locations on the game board and describe what it does and why the players should care about it. That takes a lot of time and will bore the pants off any but the most interested of gamers. But you really can’t gloss over the game, either. If you do, the enter game will be a very long and painful experience. Therefore, a middle way is necessary. We accomplished this by detailing the game at the 50,000 feet level by explaining the game goal and how players could achieve it and then swooped down over the game board to describe some key locations. We then opened up the table to questions…of which there were many. To the game designer’s credit, the game board uses very easy to read and to understand icons to help communicate actions and results. For some, however, the game board was a bit too busy and they kept trying to “connect the dots” by attempting to determine if there was some hidden meaning in the game board design. Let me save you the time and energy and suggest that there isn’t. The game board is broken up into four different territories and is heavily themed, but is really nothing more than a big control board that the players can manipulate. It took me an evening and a morning to teach Euphoria to my oldest child geek. The recommended age for the game is 13+. I often times ignore the suggested age minimum because they are more times than not influenced by game bit sizes and safety concerns. After reading the rules of Euphoria and looking over the game components, I started to think that perhaps 8-years-old was a bit too young to truly grasp the game. When I asked him his thoughts on Euphoria after all of his questions were answered, he took a moment to respond. When he did, he spoke slowly and carefully. Euphoria is most certainly not a “gateway” game. There’s a lot of demand on the player to think things through. The game board is, admittedly, a bit threatening to new and experienced players. Let’s play the game and see if it leaves our playing groups with a euphoric feeling of self-empowerment or disenfranchised. The Child Geeks never gained any momentum when playing Euphoria and mostly stumbled their way through it. There is a lot to consider at any one particular time, and while the overall actions that can be done and the goal is clear, the path to victory is not visible. Child Geeks need a path, or at the very least, signposts to help point the way. Euphoria has no set path, no signposts, and not a single guide. The world is open to any and all types of strategy and tactics and that is a really difficult place to navigate as an inexperienced player. As such, the Child Geeks spent most of their time wondering what to do next and if the actions they were taking were of any value whatsoever. From the youngest to the oldest Child Geek we played the game with, the level of game understanding clearly demonstrate that they all understood the goal but never the means in which to obtain it. This lead to confusion followed by frustration that ultimately resulted in the Child Geeks not approving the game. That look a little geek gets on their face when they have no idea what to do first…. The Parent Geeks were much the same when it came to Euphoria, and the more experienced Parent Geeks quickly left their less experienced peers in the dust. According to one Parent Geek who has many games under their belt, “This is not an easy game to win because the steps you need to take are not clearly visible.” Very true and when I asked a fellow Parent Geek their thoughts on the game after we played it who was not as familiar with board games in general, they said, “From the very start I was like, what? Then, about halfway through, I started to understand how the game was played. Too late to save the game, though.” The Parent Geeks who enjoy board games enjoyed Euphoria, finding it to be a challenging game full of possibilities and choices. The Parent Geeks who did not or were not as familiar with such board games were left feeling lost, frustrated, and slightly beaten up. The Parent Geeks were split in their endorsement for the game. The Gamer Geeks took one look at Euphoria and said, “OK, let’s go.” Euphoria isn’t introducing anything new to the gamer’s table where complex games full of strategy and tactics are common place. It usually takes a well-seasoned Gamer Geek 1 game to really understand how everything works, unless they are like my friend Steve who can look at a game and then beat the socks off of you with little effort. I’m pretty sure Steve is an alien, but for the rest of us Earth-born Gamer Geeks, Euphoria will challenge but not confuse. There are some intriguing tactics and strategies to be used in the game and there is more than enough runway to try multiple paths to obtain victory. The game is also surprisingly short and light weight for the level of thought that is necessary to be competitive. Turns are simple and quick…in theory. Even the most elitist of gamers paused a bit longer than normal as their minds went through all the possible actions they could take and what it would mean to them and their opponents. This is perhaps one of the more interesting aspects of Euphoria. While everyone is playing for themselves, their actions are also helping their opponents. Every time a player takes a step towards the finish line, so too do all the other players. In the end, the Gamer Geeks rather enjoyed the game, found it to be a challenge, enjoyed the game flow, and thought it was a good “casual” game worth taking up their table space and time. I didn’t warm up to Euphoria right away. I enjoy a good Euro-style board game, but not when the game board is presented as a big control board that is filled with figurative buttons and knobs. Games like this tend to leave me a bit cold and distant because I find myself “tinkering” more than “advancing” through the game. I also tend to be less than satisfied with games that have a clearly defined overall gaol, but the means to achieve it are mired in seemingly unrelatable actions. Euphoria is such a game and when I sat down to play it, my mind was already becoming disinterested. It took 3 games under my belt until I started to enjoy the game’s depth of play, which is a bit of an oddity for me. Once I really “got the game” (as in being very familiar with all that the game had to offer), I was able to pay less attention to the many little details and more time getting involved in the general game play. The reason I mention this is that I encourage players like myself to stick with Euphoria. It might not impress the first game through, but it’s well worth your time to play it again. There’s a lot going on in the game that slowly reveals itself through multiple plays. Why multiple plays? Because it’s impossible to explore all of the game in a single session. There’s just too much going on and the learning curve will reflect that. The upside is that Euphoria is highly replayable. But does any of this suggest that Euphoria is a good game? In my opinion, it is. It’s using tried and true game mechanisms that work well together. I don’t think Euphoria is breaking new ground here by any means, but I don’t think that should suggest anything negative. It’s solid, does what it says it will do, delivers a rewarding game play experience, and does so in a surprisingly small amount of time. For those who enjoy Euro-style games or for anyone who is looking to play more games of this kind, Euphoria is certain to leave them with a euphoric feeling. Tagged Gamer Geek Approved, Prepublished Games. Bookmark the permalink. Thanks for taking the time to read and to leave us a comment, Mr. Schott. My good friend Tox over at CritsHappen has released an outstanding “Critical Preview” of the game in question that you might find of interest. It’s almost 45 minutes long and goes into great visual detail. You can find the video here on his YouTube channel. Definitely. I appreciate the video reviews (Tom Vasel’s reviews drew me into the BG world as I realized there were a ton of more interesting options out there). I also appreciate written reviews such as yours and Ender’s over @ BGG. They’re thorough and I can get a good feel for the game without the component drop or the really long video. Besides, I appreciate the “Child Geek” perspectives in your reviews – that helps me realize whether a game might be a good fit for our family or not. In this case, not. I really like the overall look/them/mechanics for this game, but it just wouldn’t work for our normal group. Then most certainly avoid Belfort AVOID IT!!! Funny. Actually, I have Belfort and that worked well with my 10-year-old, but we admittedly played a slightly friendlier 2-player game. Part of the reason this wouldn’t work is because of the theme. I don’t think I’d enjoy trying to explain dystopia at this time. 🙂 Besides, it would make another game like Belfort in my collection and we’re running low on storage space. Now if I were given the game or won it in a contest, that would be a different story. It’s always a different story when it comes to “free games”, my friend. The dystopian theme is actually pretty thin on this game. There is no real narrative to speak of and the game’s theme is there to help support the game text, which is pretty thin at best. The look on your little one’s face (Liam, I believe) is priceless.Great review! Much thanks for taking the time to read and to comment, Mr. Haskett. I’ll be sure to let my son know his pain and confusion entertained. Thanks for breaking it down. You’ve helped build up my interest. It is my pleasure, Jude. Thanks for reading and taking the time to leave a comment.